Have you ever notice that I am always posting stuff with comments like, 'I heard about this from my sister-in-law' or, 'I got this picture from my sister-in-law' etc? Well, I keep bringing up the sister-in-laws because there are 8 of them and they all have cool, fun stuff to share. So, today we have another sister-in-law idea! Ralphie here. I am a mother to 3 delicious chickens (girls) whom I love... to make love reading. I know, that sounds a bit undermining, we're all taught to never make our children do anything. They will hate it and stick their tongues out at you. So what if we twist this theory, bend it a bit and disguise our motivated goal as FUN. PLAY. FRIENDS. Yesss. Now we're onto something. READING CAMP. The place where all your literature interconnections come true. There are so many ways of doing this. Last year was our first time giving it a go and it was such a success that we will be doing book camps/clubs every summer until they are 35. 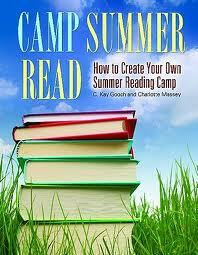 To get started I found Camp Summer Read to be an excellent resource. It's specific, gives schedules, activities, and book recommendations. And the gals that wrote it have been around the block a few times, if you know what I mean. One big modification that we made was doing a once a week camp. I'm not crazy enough to set aside an entire week for book camp. At least not yet. The camp lasted for 6 weeks. It was held once a week for 2 hours. We did it in the morning, but I would imagine the afternoons work just as well. 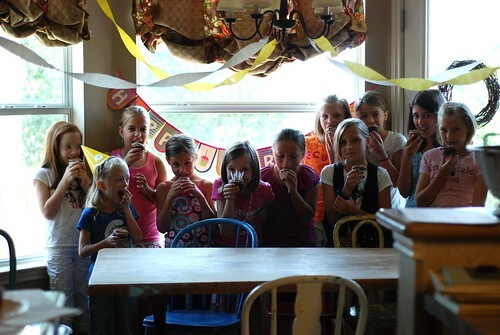 My daughter started out inviting 6 friends to participate. Then the word got out and 4 more girls were added to the mix. I also invited an older girl to be my helper. She set things out for me, cleaned up behind me, and helped me teach smaller groups when we broke up. Best idea ever! Featured Books- This took the majority of our time. We would read anywhere from 1 chapter book to 6 picture books, depending on their length. We would then talk about each one, how it had to do with our theme, and make connections to what we already knew. Activity- This activity would reinforce our theme. For experiments we made oobleck. For princesses we did our own academy where they had to pass off certain royal acts such as waving, walking with books on their head, and smiling a lot! 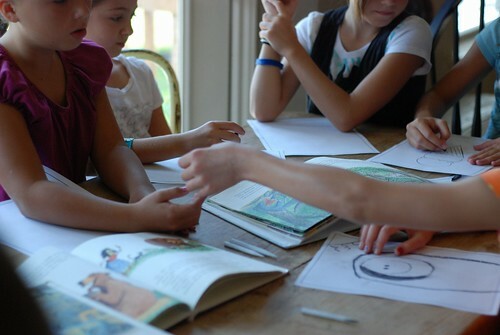 An activity with the theme "Bill Pete." 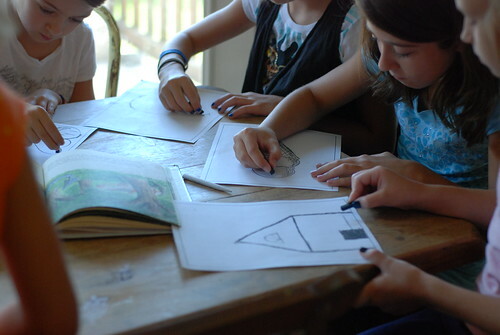 The author/illustrator used charcoal to draw his pictures, so the girls are trying their hand at it. Snack- These were provided by the girls' parents. They did an awesome job of bringing food that went along with the theme. For pioneers, one mom brought homemade bread and butter, berries and beef jerky. I found that moms were more than willing to help and it really made my job so much easier! Book Talk- For the last 20 minutes we gathered together again and I showed more themed books. I would just briefly touch on each one, giving a summary and showing pictures. Just enough to spark their interest and curiosity in the book. I made a list of these books and sent them home each week so that the girls could check them out at the library or buy them. This had to be my favorite part of the camp. I loved watching them get so enthusiastic about books! The camp was created for my oldest daughter, Queenie, who was 7 at the time. You can tweak things here and there to make it more age appropriate for your child. In fact, this summer Queenie will be doing a book CLUB, which is thrilling for her. Very grown up and sophisticated with chapter books and friends homes and presentations and being held at night and such. 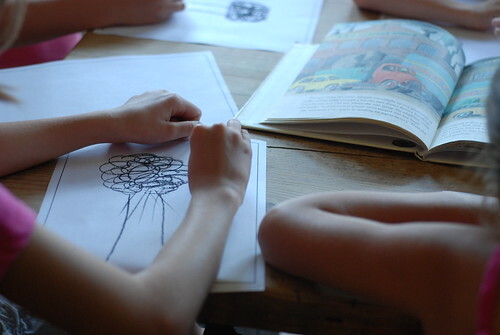 Putting a little bit of effort to get your child to love reading is well worth it. Our entire family has been blessed because of these reading adventures we have created. As parents we teach our children to read, so don't be afraid to teach them to LOVE it too. Okay enough about books for a minute. 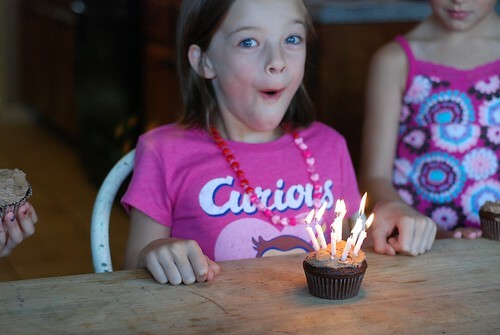 Let's reflect on the joy that is created with one chocolate cupcake and 8 candles. Hi, Whitney again! How fun does that sound? Seriously! Thanks Ralphie! I'm not even going to show this to Lilac, she's going to be double dog jealous because this camp rocked and because Queenie was there, those two have some fun when they get together! Book Camp...see I told you I have sister-in-laws with cool, fun ideas.